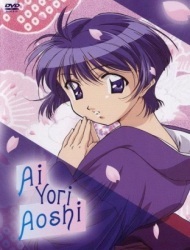 Plot Summary: Kaoru Hanabishi, a college student who lives alone, met a beautiful but bewildered girl dressed in a kimono at a train station. He volunteered to guide her way to the address she was looking for, which happened to be in his neighborhood, but turned out to be an empty lot. Not knowing what to do next, Kaoru invited the devastated girl to his apartment and asked for any additional clues to her destination. She supplied him with a photo of two children whom Kauru immediately identified as himself and Aoi Sakuraba, his childhood friend. It turned out that the girl in front of him is Aoi Sakuraba herself, his betrothed fiancee who came all the way to Tokyo to marry him. Her revelation was not only surprising but also reminded the deepest part of Kaoru's memory for why he left the Hanabishi family in the first place.